Mass Effect is epic. It’s the product of the best parts of Star Trek, Star Wars, Battlestar Galactica and more with a protagonist who could be the love-child of Picard, Skywalker, and Starbuck. It’s one of the most important pieces of science fiction narrative of our generation. Mass Effect goes so far beyond other fictional universes in ways that you may not have yet realized. It is cosmic in scope and scale. Science fiction is one of the best forms of social satire and critique. Want to sneak in some absolutely scandalous social more, like, say, oh, I don’t know, a black woman into a position of power in the ‘60s? Put her on a starship command deck. Most science fiction, even the epic universes in Star Wars and Star Trek, pick only two or three issues to investigate in depth. Sure, an episode here or a character there might nod to other concepts worthy of investigation, but the scope of the series often prevents the narrative from mining the idea for what it’s worth. Mass Effect can and does take ideas to a new plane of existence. Think of the Big Issues in your favorite series. Whether it is realistic science explaining humanoid life throughout the galaxy, or dealing with FTL travel, or the ethical ambiguity of progress, or even the very purpose of the human race in our universe, Mass Effect has got it. By virtue of three simple traits – its medium, its message, and its philosophy – Mass Effect eclipses and engulfs all of science fiction’s greatest universes. Let me show you how. Mass Effect is a video game. Specifically, a role-playing, third-person shooter hybrid, affectionally called an action-adventure game. If you’re not into video games, the idea is you run around talking to characters and exploring environments, uncovering the narrative layer by layer through dialogue, discoveries, and connecting seemingly unrelated events. There are also some parts that involve gun-fights, special powers, and explosions – hence action-adventure. As a vessel for an epic science fiction narrative, the medium of action-adventure game affords three immediate advantages – setting, casting, and emotional involvement. What does that mean for the story? That you believe that other races matter and are deeply intrenched in the galactic civilization. Because they are filmed with human actors, series like Star Trek and Star Wars leverage mostly human and very humanoid (vulcan, bajoran, betazoid) characters. Even though we are told humans are only one race among many, we somehow always end up running the galaxy and living everywhere. All the important characters who get the most screen time are human beings. Sometimes there are a few aliens that look suspiciously similar to humans, save perhaps a few odd markings, ear shapes, or nose-ridges. True aliens, those with confusing cultures or bizarre rituals, are represented by a token character who acts as a stand in for the race (Spock, Worf, Quark). 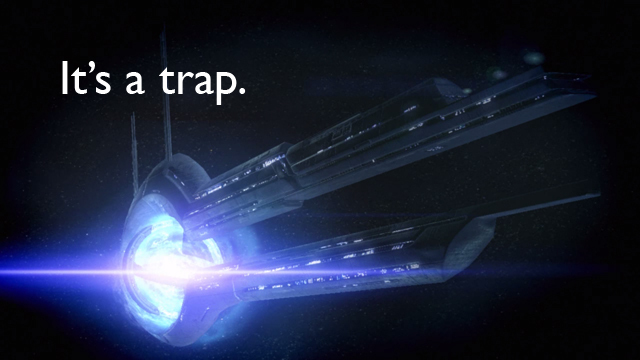 Not so in Mass Effect. Run around the Citadel and you’ll be damned if you find more than two or three humans out of hundreds of citizens milling about, shopkeepers hawking their wares, and government officials eyeing you suspiciously. The entire government of the galaxy, known as the Council, is run by non-humans. The majority of characters on screen at any given time are alien. Being able to render any race with equal ease means that as a human, you truly feel like the minority species we are. Second, the ability to customize the cast of Mass Effect is only possible with a video game. Commander Shepard’s crew on the SSV Normandy are, thanks to the ease with which non-humans can be rendered, preposterously diverse. 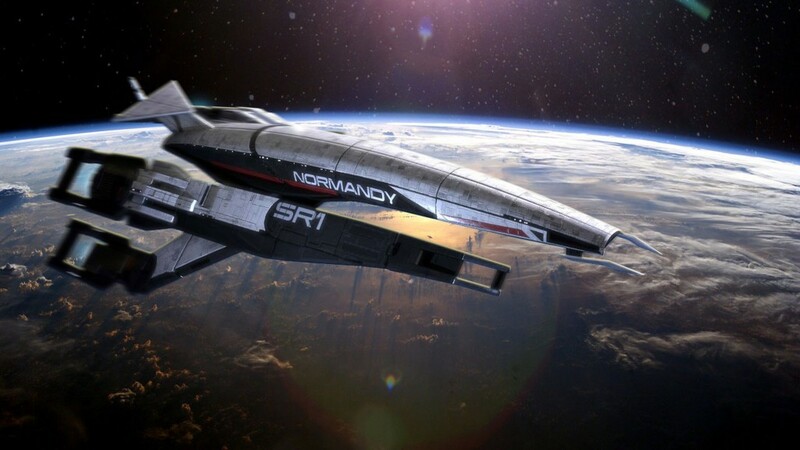 As the crew of the Normandy change over the course of the narrative, there is no definitive count or diversity statistics, but if one plays as a female Shepard, the crew usually has about a 1:1 male to female ratio, a 1:1 alien to human ratio, a few cyborgs and synthetic life forms, and about eight different species. Based on the mission and player preference, one can choose among these various cast members for each episode. The complexity of the supporting cast is matched by the amazing ability to createthe main character – something only possible within a video game. I can’t very well rewatch all of Star Trek: The Next Generation with a female Picard of Middle Eastern descent who grew up on a space station. Mass Effect gives me that option with Shepard. Given that Jennifer Hale’s voicing of Commander Shepard is widely considered superior, one is actually inclined to cast the character who will lead galactic civilization in a fight for survival as a female. One can spend hours tweaking physical appearance (not mere a few options of “races”) to get a character of any ethnicity and build. Oh, and sexuality is an option too. Shepard is yours to design. I don’t need to explain why the option to have a non-white, non-male, non-straight person as the main character of a blockbuster action science fiction story is important. 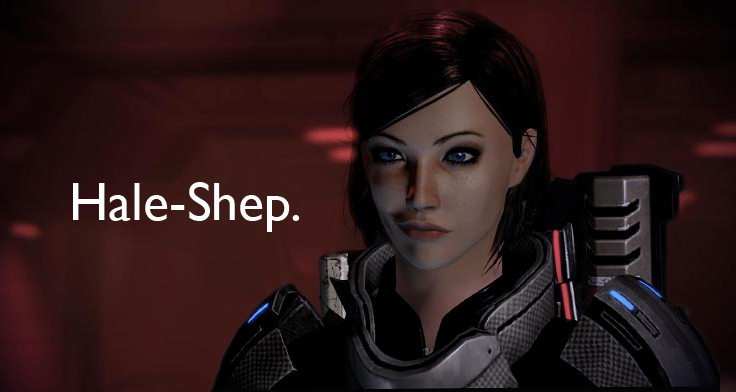 The simple fact that for every fan, there is a different Shepard, is even more amazing. Only an action-adventure video game could begin to offer that level of customization. Third, and for the sake of narrative, perhaps the most intriguing, is the player involvement in ethical decision making. RPGs and video games have had choice as an element of gameplay for some time. The critical difference is the duration and scale of the consequences of the decisions made in Mass Effect. First, decisions are not a function of gameplay but of narrative. Mission difficulty will often remain unaffected by choices, where as character reactions, relationships, and entire narrative arcs will be altered significantly by every choice. Second, decisions are persistent through each installment in the series. The combined decisions in Mass Effect 1 and Mass Effect 2 create over 1,000 variables to be imported into Mass Effect 3. The third element of decisions in Mass Effect is the scale of decisions. Choices to not research a given technology or to seek retribution against a helpless foe might result in the death of a major character or the addition of a new one. Further, each decision is clouded by an insufficient amount of information. Players often act in the dark, evaluating and analyzing the he-said-she-said of characters whose motivations are rarely selfless or noble. Even the emotions one chooses to express are optional. BioWare’s Dialogue Wheel allows one to react naturally to a conversation, expressing disdain, excitement, stoicism, lust, or a host of other context appropriate emotions. A prime example is that even during rousing speeches, the player is able to make on-the-fly decisions that alter the pathos of Shepard’s rhetoric. Further, complex and intimate relationships with squad mates is possible, but as with reality, choosing one avenue often permanently closes another, potentially even damaging a friendship or alliance. Mass Effect’s deep decision-making system is finely tuned to draw out realistic responses from players. During an interview I had with Daniel Erickson, lead writer for Star Wars: The Old Republic, he revealed two key elements of BioWare’s process that makes their games ideal for ethical exploration. The first is that quality voice acting triggers complex emotional responses in players. The second is that allowing players to choose their next line in conversation based on emotion, not the precise words written down, creates a huge level of investment by the player in the main character. Erickson mentioned that Mass Effect was the first time players had overwhelmingly identified the main character, Shepard, as their favorite character in an RPG. Caring about your character means you care how your character is perceived by others, you care how that character interacts with the world in relation to your value system, and you care about the same things and individuals as your character does. Other media ask you to evaluate and observe the decisions of the main character. Mass Effect enables you to believe the world in which the story is told, to cast the major characters and to participate in the decisions and face the consequences of character choices. In short, one cannot help but become deeply invested in the universe and narrative Mass Effect builds. The benefits reaped from making Mass Effect an action-adventure video game would be wasted if the message were not what it is. 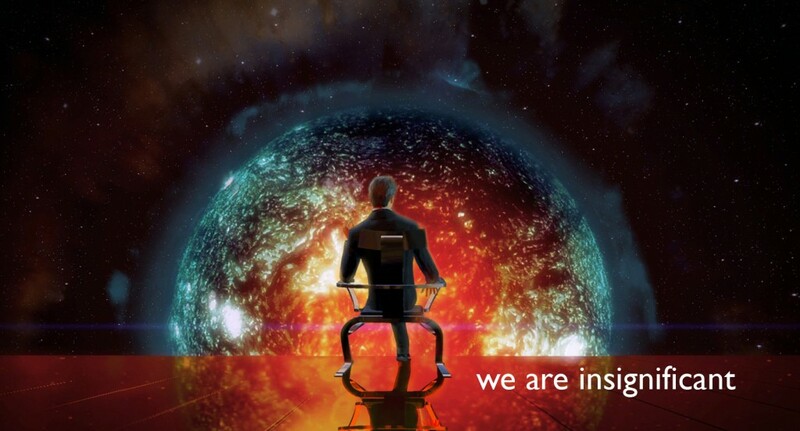 Mass Effect has a simple message: human beings are delusional about their importance in the grand scheme of things. Mass Effect starts with humanity in the galaxy where it should have been in the United Federation of Planets: unnoticed among the other minor species struggling to prove to the Council why they add anything of value to the civilization that is Citadel Space. Such a message would be laughable were it made central to Star Wars or Star Trek, where nearly every important character is human. Star Wars and Star Trek start with the assumption that humans will be important in galactic civilization. Why? In part because the medium forced that decision, but more so because both universes assume that human beings add meaning to the universe. Mass Effect doesn’t make such an assumption. Mass Effect never lets you forget that we might not add one jot of meaning or benefit to intelligent life beyond our solar system. Humanity’s minority and irrelevant status is underlined by the fact that on the Citadel we are not only new, but one among many second class species. In addition to the Council species (asari, turian, and salarian) there are four other Citadel member species in the same secondary status as human beings. There even a few other non-Citadel species with more respect than humans. Events that shaped the civilization of the galaxy, like the turians leveraging the krogan in the Rachni Wars (Enders Game meets Starship Troopers) and the quarian civil war with the geth (aka the Cylons won), were happening when humans still thought the Earth revolved around the Sun. The volus, a wheezing, whining race forced to live in pressure suits when off-world, have been petitioning for Council membership since the Ptolemaic Era. Galactic civilization is unimpressed by Earthlings. Mass Effect is colored by this message in three distinct ways. First, the actions of many major human characters almost always have a subtle undercurrent of petulance or entitlement. Humanity’s representative to the Council, Ambassador Udina, is an ideal example. Udina, a consummate politician, serves more to impede Shepard’s efforts in the first Mass Effect as he attempts to placate the Council. Udina is supplicant humanity on a bent knee. Then there is Cerberus, the seemingly omniscient conspiratorial agency responsible for Shepard’s resurrection, that is, at its core, driven by the Illusive Man’s inability to accept that human beings are a middling species in the galaxy. Mass Effect portrays our species from the perspective of the established species in the universe: we are fumbling neophytes with FTL drives. Second, the lowering of human status diffuses any xenophobic urges a player might have. Species one would normally be unlikely to care about, such as the brutish and belligerant krogan or gypsy-like quarian, are suddenly seen as kindred second-class spirits. The constant presence of other species on the Normandy, a human Alliance/Cerberus ship, is a perpetual reminder that we are out of our depth in the universe. No problem, no matter how much the player may want it to be, will be solved unilaterally by human gumption and know-how. Remember how big a deal I said it was to be able to play as a female, racial and sexual minority Shepard? Ok, now imaging playing that character within a context whatever the player’s gender, race, or orientation, that the simple humanity of the player is subjected to believable and, within the Mass Effect universe, true prejudice, insults, and scrutiny. The impact of the message on the player’s interactions with other species is that, after facing what feels like unwarranted treatment, the player is forced to recognize the perspective of any species one might encounter along the way. Mass Effect makes you view the reflection of humanity in a mirror darkly. Third, by undermining the player’s sense of pride in being human, Mass Effect also opens doors to what would likely be highly controversial discussions were humanity “in charge.” In fact, Star Trek provides the ideal contrast on the issues of genetic engineering, cyborgs, and artificial life are all addressed as ultimately threatening to humanity. In Star Trek (TOS, TNG, & DS9), those who are genetically engineered are seen as myopic elitists and supremacists, convinced of their own vaunted status, not wishing to allow their world to be “tainted” by those who are impure. In Mass Effect, Miranda and Grunt are rich and rounded characters who are genuinely superior in some aspects due to their modifications, but also reflect the increased self-awareness and contemplativeness we would hope to see in a superior being. In Star Trek cyborgs (Borg) and androids (Data) are one of two things: a threat to humanity or desperate to emulate it. In Mass Effect, Shepard’s resurrection leaves her largely cybernetic while EDI, the ship AI, and Legion, an autonomous mobile geth platform, are more interested in helping and understanding humans than they are attempting to become or obliterate human beings. Legion even corrects a crew mate at one point, mentioning it does not see itself as artificial life, but as synthetic life – that is, not a mimic, but a new and equally valid form. Shepard’s constant discussions with, dependance upon, and similarities to her non-organic crew members is made more accessible to the player due to Mass Effect’s questioning of human exceptionalism. Mass Effect’s message is designed to open up narrative complexity by destabilizing the player’s sense of confidence in his or her own skin. By undermining the value of being human, threatening and novel lifeforms become relatable, minority aliens become allies, and human intentions become questionable. As an action-adventure game, the player is more likely to become invested in the message because the setting, cast, and interactivity of Mass Effect creates a more visceral emotional connection to the narrative. All of which serves to enable Mass Effect’s philosophy. In nearly every great popular science fiction universe, there is a flaw. Born of systemic bias, the flaw is one that fundamentally undermines the narrative that carves its way through the characters, species, technologies and worlds that populate any given sci-fi story. Our greatest stories set in space often reference the flaw with oblique references to a long forgotten species, cataclysmic events, or godlike entities. Something is wrong with the universe, but we cannot place it. Consider the canon of epic science fiction universes. Like a black hole one can see the flaw by observing the light cast in those moments that confront it at its edges: the series finale of BSG, Q’s tests of Picard, the Butlerian Jihad, the Buggers, the Borg, the obliteration of Alderan by the Death Star. Yet ultimately each of these narratives turns away, unable or unwilling to withstand the abysmal gaze emanating from the depths of the universe. The flaw in every science fiction series is that they shy from the deep horror of the existence of intelligent life in infinite spacetime – save for two: the one that brought first brought it to our attention and the one that sees this horror as the framework for reality. There is no recognizable divine presence, such as a god, in the universe, and humans are particularly insignificant in the larger scheme of intergalactic existence, and perhaps are just a small species projecting their own mental idolatries onto the vast cosmos, ever susceptible to being wiped from existence at any moment. This also suggests that the majority of undiscerning humanity are creatures with the same significance as insects in a much greater struggle between greater forces which, due to humanity’s small, visionless and unimportant nature, it does not recognize. Organic life is nothing but a genetic mutation, an accident. Your lives are measured in years and decades. You wither and die. We are eternal. We are the pinnacle of evolution and existence. Before us, you are nothing . . . Your civilization is based on the technology of the mass relay, our technology. By using it, your society develops along the paths we desire. We impose order on the chaos of organic evolution. You exist because we allow it. And you will end because we demand it. In doing so, Mass Effect forces the observant player to ask, “Why fight for survival in a meaningless universe?” From the answer stems a story that demands the player confront the purpose of human beings in the galaxy at every level. To play Mass Effect is to consider the value of the lives of other species, the meaning of life on a cosmic scale, and the importance of individual relationships in the face of cataclysm. 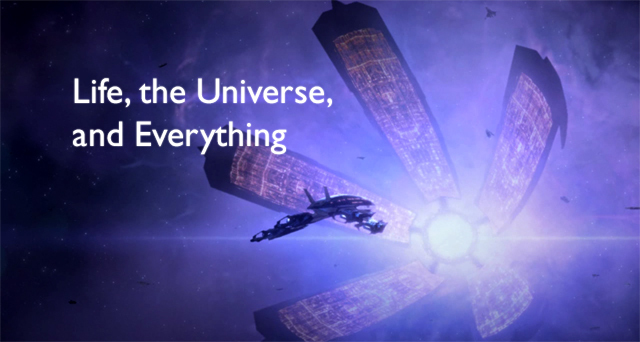 The framework of Cosmicism allows Mass Effect to explore the progression of intelligent life in an incredible way. First, one must accept the premise that the technology to explore the universe is a trap and a structure that forces galactic civilization to follow an invariable path. Like Descartes’ mischievous demon or Hume’s apathetic creator, the universe is indeed the product of an intelligence, but a negligent one at best, a malicious one at worst. From this antagonistic framework, we see a galactic civilization that is built on the worst case scenarios of the great science fiction stories. The quarians are an exploration of a species that creates intelligent machines, neglects them, and then loses the war (contra BSG). The drell and hanar explore the world-ending impacts of climate change and the need to evolve an entire species to survive on a new, alien planet. The krogan are a reptilian war society recruited to stop an intelligent insect invasion (a la Starship Troopers and Enders Game) at the behest of an amoral science-at-all-costs species, the salarians. When the krogans have finished their task the salarians release a genophage causing 99 out of 100 krogans to be stillborn – that is, one of the leading cultures of the galaxy committed reproductive genocide against the very species it uplifted. Cosmicism underpins Mass Effect’s ability to show the permutations of how the Drake Equation imagined intergalactic civilizations: warts and all. Within the fear of the universe comes a liberation from biological normativity. The asari are a female only species with a thousand year life span. As the cultural leader of Citadel Space and most mature of galactic civilizations, the asari are a species evolved for interstellar life. As with the Xenogenesis series, the asari can utilize alien DNA in their reproductive processes, making them the potential partner of any species they encounter. But the result is not a hybrid creature, but an asari through-and-through. What initially seems to be a species designed for intergalactic community becomes a kind of consumptive force, slowly but surely perpetuating itself at the cost of another species’ offspring. The racial fear of being bred out of existence escalated to a new level. Further, the fear associated with biological destiny translates to transcending the biological in both body and mind. Citadel Space is dominated by the same law as Dune’s planetary empire: a ban on artificial intelligence. The quarian war with the geth is not merely the victory of the cylons but also an allusion to the Bulterian Jihad. As a result even the friendly EDI, who never actually does anything to indicate she is a hyper-rational decision machine (i.e. HAL 9000), is viscerally feared by the Illusive Man, Joker, and Shepard herself. Legion’s playful mocking of biological limitations contains implications of organic obsolescence. Moreover, there are bountiful deviations from prosaic biology including: Jack’s biotic powers; the cybernetics of the Lazarus project that resurrected Shepard; the dexo-protein biology of quarians and turians; the human computer core of project Overlord; the eugenics inherent in the perfect Miranda and her equally designed sister; and the pure engineering of Okeer’s genetic manufacture of Grunt as a template for krogan clone warriors. The violations of biology and the disregard for the natural are no longer obvious evils in a universe in which the path of life and civilization itself is an artificial and designed construct. Cosmicism opens the value of “natural” up for critique. Underneath it all, there is the Cosmic Horror of Sovereign, The Collectors, Saren’s indoctrination, and the Keepers. Mass Effect has not one but two entire species – the Keepers and the Collectors – that exist as mindless drones at the beck-and-call of the Reapers. It is herein that the great flaw of the universe so often unaddressed by science fiction is elevated and exposed by the narrative of Mass Effect. The Reapers are biomechanical equivalents of the Elder Gods of H.P. Lovecraft. If the xenomorphs in Alien had a deity, it would be a Reaper. Inconceivable, immortal, uninvolved super-beings that are not divinities per se, but so far beyond our realm of existence as to drive insane those who encounter and worship them. The seat of being, the mind, becomes rent apart and irredeemably misshapen to bend to the whims of a malevolent ancient life form. The resulting slaves, the Keepers and Collectors, act without thought, remorse, or concern. And they become all the more horrible once they are fully revealed. The Keepers are thought to be beneficent until it is revealed they serve not the inhabitants of the Citadel, or even the Citadel itself, but the purpose of ensuring the Citadel will serve the cyclical apocalypse. The Collectors are revealed to be the remnants of the Protheans – the foundation species that was thought to be the galactic civilization in the wake of which Citadel Space had formed. Instead, Mass Effect exposes the very basis of intelligent exchange in the universe, the Mass Relays, to be a Trojan Horse. Reality is a ruse. Progress a lockstep, well-treaded path to oblivion. Thus, we are forced with the question: Why does any of this matter? Why should we care that Mass Effect deals with any of these issues? The reason is this: Mass Effect is the first blockbuster franchise in the postmodern era to directly confront a godless, meaningless universe indifferent to humanity. Amid the entertaining game play, the interspecies romance, and entertaining characters, cosmological questions about the value of existence influence every decision. The game is about justifying survival, not of mere intelligent life in the universe, the Reapers are that, but of a kind of intelligence. Therein the triple layered question – What value does galactic civilization bring to the universe; What value does humanity bring to galactic civilization, and What value do I bring to humanity – forces the player to recontextualize his or her participation in the experiment of existence. By exploring and expanding upon the big questions asked by the last century of science fiction, Mass Effect has become the standard bearer for the questions the next century of science fiction will seek to answer.